The Days Ahead: Earnings continue. Also look for wage news and jobs. One-Minute Summary: Another roller coaster week. Stocks managed to recover earlier losses and on Thursday halted a six-day losing streak. Economic numbers were generally slow but investors weren’t paying much attention to the macro. The pullback was wide-spread. Some 40% of S&P 500 companies are now down 20% from their highs. Treasuries were stronger. Overseas markets were down too for many of the same reasons: geopolitics, tighter financial conditions (the ECB said it would start to raise rates in 2019) and some weaker earnings. U.S. earnings have been in line and…remarkably strong, especially if we use year over year numbers. Companies reporting so far have shown a 22% gain in earnings. But investors focused on peak margins, the dollar, weak housing and a fear the Fed will make a policy mistake i.e. hike rates too soon. Bear in mind, too, that we are in a blackout for share buybacks. Companies cannot buy their shares in the weeks leading up to earnings. So a notable buyer has been noticeably absent for some weeks. That will change soon. 1. Psych 101 – Stock Markets: Ha, just joking. We don't know anything about psychology. But we do know markets…how they mess with you, and are your frenemy. The news cycle obviously loves this stuff. Quoting Dow Points because “Dow down 1000” is way more dramatic than “Dow down 6% and back to August levels…but readers, please be aware that the Dow is a deeply flawed price weighted index and should not be used for performance measurement purposes”. And while we’re on the subject of hyperbole, verbs like plunging, collapse, panic, rout and bloodbath (OKfelev, we know you can use a thesaurus already) and pictures of exhausted stock traders really don't help. By the way, all those verbs were in Bloomberg last week…and they're meant to be a voice of reason. We'd say that we’re somewhere between the two circles. And we’re not trivializing the emotions that come with losing money but here are some things we know. All major asset classes have fallen: that usually means it’s a broad, sweeping move. The down days are not driven by analysts reading through Caterpillar’s 10-K and concluding their business is worth 30% less today. It’s a large push-one-button trade. U.S. Treasuries rose: that’s the way it’s meant to work. A typical 10-Year Treasury note rose about 1% in price last week. Defensive sectors outperformed: Staples and Utilities. Again that’s the way it’s meant to work…a move to relative safety. Tech was hit: about time. It was a one-way trade for nearly two years. Google beat earnings by 30% but revenue missed by $160m, which sounds a lot until you realize that Google’s daily sales are $360m so they missed about 10 hours of sales. The stock fell 3%. Same story with Amazon. We' think tech had got well ahead of itself and profits were there for all to sell. Volatility felt bad: but that’s only because of the extraordinary calm that preceded it. We've written at length about the lack of volatility in 2017. We only had two days from 2012-2017 when stocks fell 3% and so far in 2018, we've had four such days and two of those in October. But, this is normal for equities. And we’d expect more volatility as interest rates rise. The market is not behaving irrationally: the Fed said they think rates should be higher than they are today (and they said it again last week, here) at the same time as the housing market slowed, the trade deficit shot up, the budget deficit widened and retail sales were off. Higher rates and lower growth mean lower earnings. Rotation: some of the biggest gainers in the nine months to September have corrected the most since mid- September. On the other hand some of the biggest gainers in the last month had a torrid 2018. Again, we'd expect that. A company like LBrands, a fine company but right in Amazon’s cross hairs, is down 50% this year but up 20% since September. Investors were simply seeking out bargains. We've already made a move to #4 earlier this year. Because it's a lot easier to make decisions under calm than duress. We like the dividend payers and the fortress balance sheet types, like Berkshire. We also invested more in Treasuries. We may trim some positions where the fundamentals have really changed but there aren't many of those. 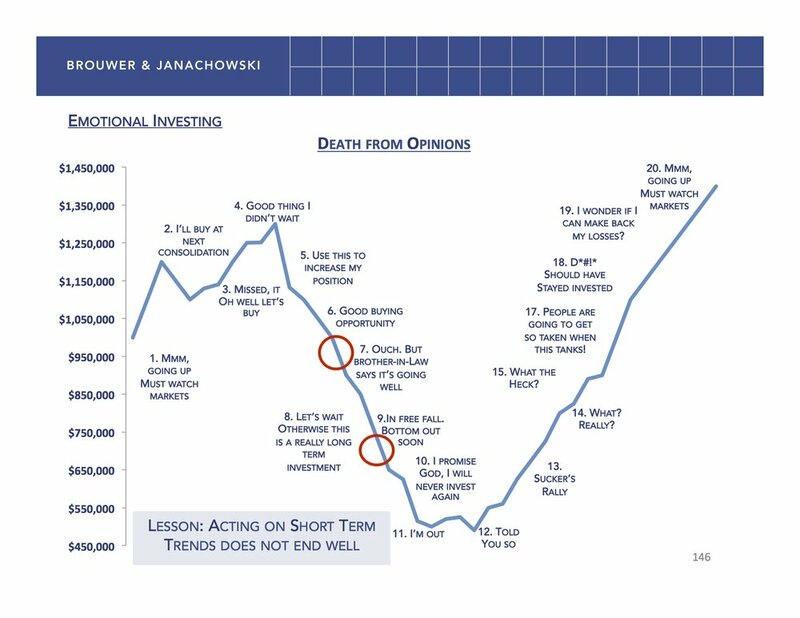 Finally, we'd share a chart in which we take some comfort. The black line is the S&P 500 price. It's had some pretty big swings. See 2015 to 2016 and, of course, this year. The blue bars and green line are the earnings and dividends of the S&P 500. There is an unmistakable upward slope to both and a surprising lack of volatility. Prices do indeed change more than fundamentals. Forward price-earnings ratios are now at their lowest since 2016. It doesn't mean there won't be more corrections but corporate America is generally in good shape. 2. The mystery of lower job participation. Labor participation has fallen by 5% since 2000 and never recovered from its pre-crash highs. Some said that was all down to demographics. The baby boomers were retiring in big numbers…some 10,000 a day. The blue line is the biggest cohort of prime-age workers. It’s the same size it was 12 years ago. The other line is workers aged 55 and over. That's up by 10m or 42%. We get that older workers may choose to stay employed for financial or lifestyle reasons and that service and non-manual jobs mean workers can stay employed longer. But the decline in prime age workers is more concerning. We think one economist we know has put his finger on it (here but behind a paywall). It’s the opioid crisis. It kills 70,000 a year so there are probably around 1.2m to 1.6m people using opioids (no one keeps count). They have dropped out of the labor force. If they were in, participation would be around 1.5% higher. Aside from the sheer human misery of it all, it means there is a smaller and tighter labor force than there should be. The 55 and over group will retire and that will lower the country’s growth potential. Not this year but certainly in two to five years. It’s lower than Q2, as everyone expected. As we’ve noted before, the tax cuts were front-end loaded meaning they put immediate cash in hand for the corporate and personal sectors. That showed up in Q2 with higher investment and spending. There was also the boost from trade as exporters rushed to fill orders before the tariffs kicked in. All those rolled over in Q3. The numbers would have been worse but companies rebuilt inventories and government spending rose 3.3%. The net trade position also fell sharply, as we thought it must. We look forward to the spin on this as the trade deficit is now $40bn worse than the beginning of the year and $100bn worse since the tariffs. All told, there is nothing in the numbers to prevent the Fed raising rates in December. Bottom Line: October has been rough. Midterm elections have usually been a good time for stocks. In the last 13 midterms, back to 1966, there has been only one down market in the October to February period. The average return is 12%. Credit is also holding up well. We'd be a lot more nervous if we saw things like leveraged loans, banks, credit defaults swaps or High Yield having problems. They're not. And that’s a good sign.